Mari 1.3v2 is finally available! Finally! This was one of the reasons why I bought a copy of Mari! The bridge between Nuke and Mari makes these two an uber-powerful combo! Here are some information about this update and Frank’s video demonstrating the power of this tool. That’s right, I bought my first license of Mari a week or so ago and have been toying with it since. I’ve been looking for a usable and flexible texture painting app aside from Cinema 4D or Deep Paint (is it still being developed?) that can take on really complex projections and meshes. The way Mari handles its project data and the textures is absolutely fabulous! Oh, and did I mention Mari also sports Python? Originally I wanted to buy Mari prior to buying a license of Nuke X and Furnace, but then the job I would have needed Mari extensively for got cancelled, unfortunately, so I put it on hold. Then, recently, I saw Frank Rueter’s Nuke/Mari workflow video and immediately fell in love with the idea of software interoperability! 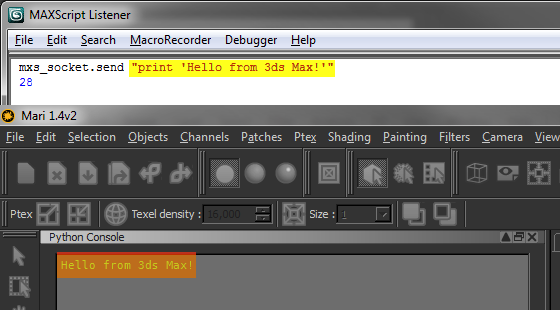 So, after playing with Mari for a few days and bugging the support team at The Foundry (about one undocumented feature of Mari’s command port), I now have everything I need to make Mari and 3ds Max communicate the same way as Frank demos with Nuke in his video. Anyways, expect at least a preview of the things I’m about to do with Max and Mari in the near future. Stay tuned!